i bought two of these. Gave one to my youngest daughter on her wedding day. Will present my older daughter hers in a month or so. It is very appropriate for both of my daughters. Very disappointed! Basically a bait and switch the quality of the is fine, however it is so small you almost need a magnifying glass to read the inscription waste of money! Even this review process is a joke! They fill in the number of stars for you at 5 and then just want you to hit submit! 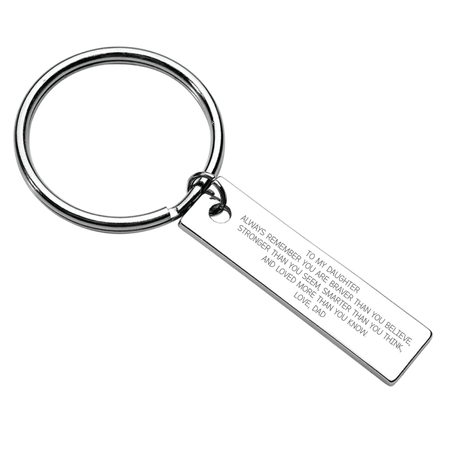 Nice key chain, just wish the writing was bigger so you could read it..
Much smaller than expected. Took a long time to receive.